In honor of Breast Cancer Awareness month, Ghirardelli LUXE MILK is inviting you to join them in their journey to raise up to $100,000 for the National Breast Cancer Foundation (NBCF). To help promote their cause, and a cause that's near and dear to our hearts, The Muffin is giving away 3 of their specially marked pink bags to 4 winners. Each of the 4 lucky winners will receive a pink bag of each flavor (milk, almond, and hazelnut). To enter, please leave a comment and answer this question: What's your favorite flavor of chocolate? We will randomly choose 4 winners to receive 3 bags each. Must enter by Thursday 10/28/2010 11:59 PM PST. More about the cause: By purchasing a specifically marked pink bar or bag of LUXE MILK, you will not only get your chocolate fix, but you will also be helping a wonderful organization. 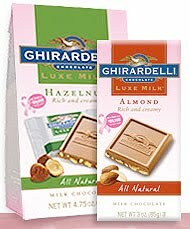 Each specially marked product contains a unique prize code and for each code entered at www.ghirardelli.com/LuxeMilk, LUXE MILK will donate $1 (up to $50,000) to the NBCF. As an added bonus, when you enter your code at the site, you will be automatically entered to win instant prizes, including Cole Haan gift cards. If you would like to win 3 pink bags of Ghirardelli LUXE Milk Chocolate and enter the codes on the Luxe Milk site to support the National Breast Cancer Foundation, just leave a comment below and tell us what your favorite chocolate flavor is. We'll randomly pick 4 winners after the contest closes and announce the results in our comments section on Friday 10/29/2010. So leave a comment, and check back to see if you won! My favorite flavor is definitely the hazelnut. When I was a kid in Portland, Oregon, my family had three filbert trees in our back yard. Yummy. I don't remember when "filberts" became "hazelnuts" - but I still love them, whatever they're called. Thank you, WOW, for all your posts all the time - but especially for the tours and articles and contests this month related to breast cancer awareness and fundraising! Milk chocolate has always been my fav!! My favorite flavor of chocolate? And yes, if you had visions of Cookie Monster with that answer, you'd be spot on! I love dark chocolate with either coconut or orange. Actually, I pretty much love dark chocolate with anything except hot pepper! I love milk chocolate. If it has nuts in it, that just makes it all the better. Thanks. My favorite is probably milk chocolate, although I am beginning to like dark chocolate more and more--especially now that it's considered a health food! I love milk chocolate with nuts, even better. And with peanut butter, yum! definitely hazelnut and peppermint is a close second. Dark chocolate with raspberry. I am getting hungry just thinking about it. Milk chocolate. I also like it mixed with almonds or toffee bits. YUM. ...It's almost lunch time and now I want chocolate. My favorite flavor is dark chocolate. I ADORE dark chocolate with toffee chunks. But unfortunately it is hard to find in stores!!! Like the healthy aspect of dark chocolate but have to say that Milk Chocolate is my fav! I love dark chocolate with ginger and orange, but any dark chocolate will do. Oh, and some nuts are nice, too! I actually like white chocolate, which isn't real chocolate, but it's close. I LOVE Vosges' curry powder and coconut flake chocolate!!! Sure, "curry powder" doesn't come readily to mind when you think of chocolate, but hey: don't knock it 'till you've tried it! I love chocolate covered coconut. Out of the three giveaways, I LOVE dark chocolate (w/red wine--yummy). This is a great way to promote Breast Cancer Awareness! Chocolate ALWAYS gets my attention, especially with nuts! Thanks Ghiradelli and the Women of WOW! All of the other chocolate flavors 'don't got NOTHIN' on milk chocolate and almonds. I love milk chocolate, especially if it's mixed with nuts or mint. This is a great post and a great cause! Milk Chocolate. Hazelnuts or almonds are nice, too. No peanuts, please. Ya ever wanted to smear chocolate all over your body? Or drink molten chocolate? Not chocolate milk, mind you? Love the almond...no milk chocolate,wait make that dark chocolate!Awe, guess I love them all so it's hard to choose just one ! Call me bitter - bring on the dark chocolate. I tend to favor dark chocolate with chili, but I definitely want to try these and of course I'll remember to enter the codes to support breast cancer research! Dark chocolate with raspberry and chopped walnuts. It makes everything better!! I love all chocolate but lately I've been really enjoying dark chocolate. I love milk chocolate with something in it, like nuts or peanut butter! My fave is hazelnut. I love the flavor! I also love any with caramel! Milk chocolate preferably with hazelnuts! Dark chocolate with raspberry filling...yum. Milk chocolate with toffee is my all-time favorite! Thanks! I love the raspberry chocolates and chocolate with almonds is just classic. :) I say YUMMY to it all! Dark chocolate was my favorite for a long time, but now that I'm getting older, and mellower, I'm developing a taste for milk chocolate. I'm looking forward to another taste change in my senior years! White Chocolate is mt favorite. Drool. Milk chocolate with any kind of nut. Thanks!! Milk Chocolate is my favorite, but actually, any chocolate is GOOOOD! My favorite flavor is Milk Chocolate. my fav is plain milk chocolate. I love milk choclate but do like dark if it isnt too strong a content that it is bitter. my fav. is the milk chocolate. Yummy! Thx you and hope the goal is reached! I love Milk Chocolate, plain or with toffee. I love the Chcoclate Orange that I find around christmas time every year. Really Yummy! Dark chocolate is best for me, and with almonds or hazelnuts is best, and best for you, too! I'm partial to Milk Chocolate. I really like a milk chocolate with hazelnut added. I like super dark chocolate, especially with almonds. I like hazelnut. As for all chocolate, I love chocolate & peanut butter together. mmm. I love milk chocolate with fruit & nuts. i like milk chocolate with almonds or caramel. My favorite chocolate flavor - hazelnut - am nuts about it!! And I have 2 wonderful Hot Chocolate recipes using Ghiradelli chocolates on my blog so choco lovers are encouraged to come visit, read and create these sumptuous wickedly delicious choco treats for themselves!!! My favorite flavor of chocolate is Dark Chocolate! My favorite flavor is definitely any ...nut, especially the hazelnut. Just purchased the Dark Chocolate and mint. Mint chocolate chip is my favorite. During the holiday season, I break them up and put them in cookies to bake or muffins. Tastes great and smells divine baking. My favorite chocolate flavor has to be hazelnut! Yummmmie! Milk Chocolate would be favorite! My favorite chocolate flavor is dark chocolate, especially when mint is added. Thank you for the lovely giveaway. My favorite chocolate flavor is dark chocolate, thanks! My favorite chocolate flavor has to be hazelnut! I'm a fan of dark chocolate. my favorite flavor ghirardelli is the peanutbutter but my favorite flavor chocolate of all time is mint! My favorite flavor depends on my mood, but peanut butter, mint, caramel and toffee are all favorite accompaniments to chocolate. And in general, I prefer dark chocolate. Yum! My fave chocolate is Milk Chocolate since I love creamy but of their flavors, Hazelnut is the best! My favorite is plain dark chocolate - but any chocolate is good. Thanks! I like dark chocolate with almonds. I have 2 faves... mint and rassberry. Dark Chocolate but all are Scrumptious! Tough one! Love chocolate with berries, like dried raspberry or cranberry. Also like chocolate with hazelnuts, love coconut with chocolate, and I am partial to dark chocolate! dark chocolate is my favorite, plain or with hazelnuts, with coffee flavor, various fruit, etc. I love it with hazelnuts or crispy rice. We held a random drawing (by using random.org), and have selected 4 winners to receive 3 bags each of Ghirardelli LUXE Milk Chocolate (milk, almond, and hazelnut), and the chance to win more prizes through the Ghirardelli site (http://www.ghirardelli.com/LuxeMilk). Thanks again, everyone! And if you didn't win, remember, you can still support the cause by purchasing one of Ghirardelli's specially marked pink bags to help support the National Breast Cancer Foundation.